Robert Y. C. Leong fluent in Cantonese, Mandarin and English. Canada Immigration Application Appeals and Inadmissibility Lawyer - CLICK for more on his background profile and contact him. 3 Certified Immigration Consultants - members of Immigration Consultants of Canada Regulatory Council (ICCRC): Vivien Lee, NP; Rita Cheng & Akiko Fujita. These consultants are fluent in Cantonese, Mandarin and Japanese / or English. The team includes members originally from Hong Kong, Singapore and Japan. Vicente Asuncion Jr., JD, fluent in Tagalog, Spanish and English based in B.C. EinwanderungKanada.com fluent in German, French and English Is licensed to practice in Germany as well as in BC Canada. Monika Sievers-Redekop LL.M. ist seit 1995 zugelassene Rechtsanwaeltin beim Oberlandesgericht Hamburg und seit 2000 zugelassene Rechtsanwaeltin in Britisch Kolumbien. Seit 2000 praktiziert sie ausschliesslich kanadisches Einwanderungsrecht und assistiert bei Bedarf in rechtsuebergreifenden Angelegenheiten in Zusammenarbeit mit der Kanzlei in Hamburg. Wir beraten Mandanten zu allen Fragen des Erwerb einer Arbeitserlaubnis in Kanada sowie der Einwanderung als Skilled Worker mit oder ohne Arbeitsangebot, als Geschaeftsmann, als Investor oder beim Familien- Sponsorship einschliesslich der Provinzprogramme, die eine Einwanderung ermoeglichen. Selbstverstaendlich assistieren wir beim Erwer b der kanadischen Staatsangehörigkeit und der doppelten Staatsangehörigkeit und dem Erhalt der Permanent Resident Karte. Nancy Elliott, B.A., LL.B studied Chinese in Toronto, Beijing & Taiwan. .. "She studied Mandarin at the Beijing Foreign Languages Normal College in 1986 and at the Taiwan National University in 1987. She was provided a grant to research Chinese law in Beijing, Chongqing and Kunming." 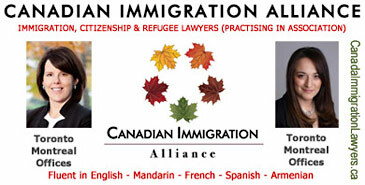 Fluent in English, Mandarin , Spanish and French, she has handled hundreds of applications for permanent residence in all categories and has successfully represented clients at every type of immigration hearing, including admissibility hearings, appeals at the Immigration Appeal Division and at numerous applications to the Federal Court of Canada. Mary Keyork, LL.B., LL.M. Certified [Canada] Citizenship and Immigration Law Specialist for immigration, citizenship & refugee cases with offices in Toronto & Montreal, is fluent in English, French and Armenian (Eastern and Western) and has conversational abilities in Spanish. Jeremiah served for several years on the Board of Directors for Calcutta Missions of Mercy and of New Missions in Haiti. In recent years, he has made trips to the Middle East to consult with clients. In addition to her practice for Immigration Appeals and Inadmissibility Cases - she also handles work permits, labour market opinions, NAFTA work permits,and permanent residence applications. fluent in French, English, Armenian and some Spanish is a Immigration lawyer, experienced in application appeals, at Federal Court, inclding work with refugee claims. She also handles work permits, labour market opinions, NAFTA work permits,and permanent residence applications for other immigrant categories. Has practised Immigration and Business law in British Columbia since 1983. He holds both a Bachelor of Laws and a Bachelor of Commerce from the University of British Columbia, and is considered an innovator in the convergence of Business, Technology and the Law. Jeffrey is the Chief Inspirational Officer of Lowe & Company, CanadaVisaLaw.com - and has taught Immigration Law, Practice Management and Legal Ethics to lawyers across Canada since 1990. This site is in part sponsored by lawyers participating in CanadaLegal.info wanting viewers using smart phones to have quick download times and images optimized for smaller screen smart phones. This site optimized for smart phone users 15.04.21.